Mixes a fog color into the source clip using depth values from a ZBuffer input. 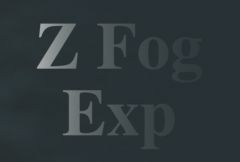 The fog starts at the nearest depth and increases exponentially to the farthest depth at a rate depending on the Fog Density. Z Buffer: Selectable. The input clip containing depth values for each Source pixel. These values should be in the range of black to white, and it is best if not anti-aliased. Normally black corresponds to the farthest objects and white to the nearest, though this can be adjusted using Z Buffer parameter. Fog Density: Default: 0.7, Range: 0 to 1. The density of the fog. Fog Color: Default rgb: [0.5 0.5 0.5]. The fog color should normally match the sky or background color of the source clip. Use gray for mist, brown for smog, blue for underwater, etc. Z Buffer Type: Popup menu, Default: White is Near . How to interpret the values in the Z buffer. Black is Near: Black pixels in the Z buffer indicate that the object at that point is near (close to you), and white means far away. White is Near: White pixels in the Z buffer indicate that the object at that point is near (close to you), and black means far away. Z Buffer Use: Popup menu, Default: Luma . Determines how the ZBuffer input channels make a monochrome z image.